During exam season, attention is focused on how to register facts, ideas or techniques in students’ memories, and how to get them to recall the ideas or techniques from this mysterious store. In preparation for last summer’s exams I tried an approach using Post-it notes. 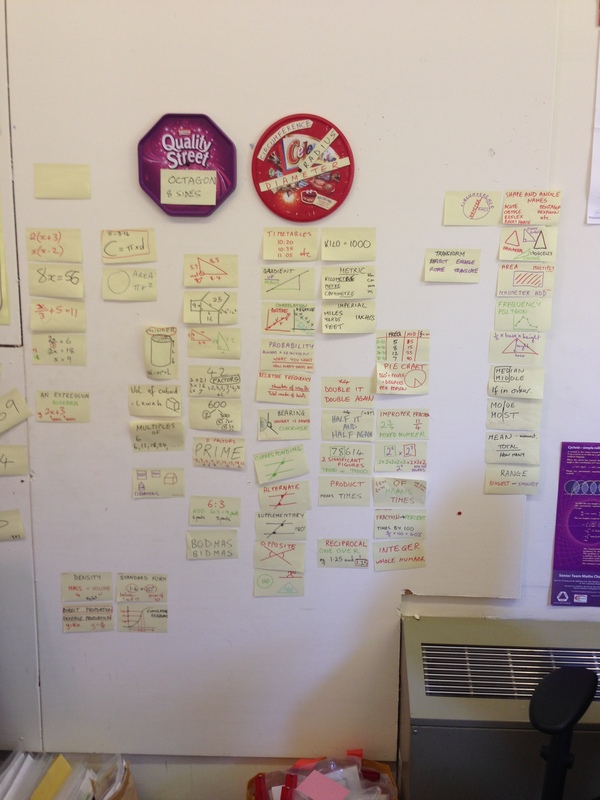 As we work through past papers, when facts or techniques are needed we add a Post-it note to the Campaign Wall. Simply sticking the note on the wall is kinaesthetic, as is rearranging them (the adhesive is very forgiving) into topic areas, or into I KNOW and I DON’T KNOW lists. For some students this act can help them recall a fact from the position it was placed, or even from something unexpected such as the note falling to the floor and having to be picked up. When we look at other exam papers subsequently and a fact or technique is required, rather than just repeating it we tear the note from the wall and place it on the desk next to the exam paper. There is probably not much new here. Students and teachers have stuck reminders on their walls for many years. (One student told me she puts notes on the back of the toilet door, which she stares at while sitting on the toilet!). Probably the best use of such methods is for the students to make their own notes, and create their own highlights and memory codes. However, to take possession of the Campaign Wall this year, students have been taking photos with their iPhone or iPad, which they can then read at any time. See the example attached. Although the picture is too small as a whole, using the usual two fingers screen zoom allows each note to be read clearly. As with many of the techniques I try, there seems to be merit in them being rough and ready – handwritten not computer generated, crossings out if they occur, shaky hand held video …. Many students appear to rebel against the perfect presentations afforded by learning programmes and computer based teaching schemes (irrationally, I think, particularly as I write lessons for MyMaths). Mixing up technology with more down to earth methods may break this resistance down a little. Why not have a go?